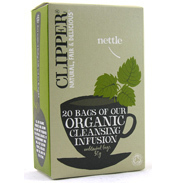 The perfect caffeine free alternative to black tea and a natural source of antioxidant. This Clipper organic version Rooibos is an herbal infusion prepared from the whole bush grown only in the Cederberg Mountain region of South Africa. 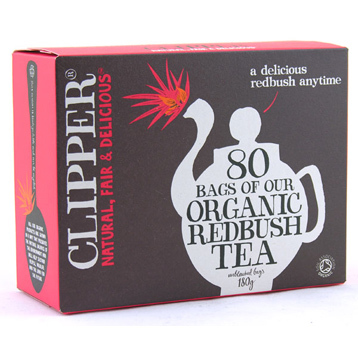 Box includes 80 unbleached bags of Organic Redbush Tea, an excellent alternative to black tea that's naturally caffeine-free and is delicious served with or without milk. Clipper products are made with a pure ingredients and a clear conscience. Clipper only use the highest-quality sources, add nothing artificial and strive to improve the welfare of the workers. No wonder they taste so good. Organically grown redbush (Rooibos), GB Organic certification 5, produce of South Africa, imported ingredients, packed in the UK. How to make the perfect cup of Redbush: Always use fresh water, pour it over the bg while it's still boiling and allow to infuse for 2-5 minutes. The rest is up to you.